The ethical and sustainable fashion movement is definitely multifaceted. There are many factors at play, and barriers to overcome in order to push the needle forward. While there has been an upswing of designers, brands, bloggers, and journalists who have decided to use their platform to praise and promote eco-fashion, there's one thing that still seems to be missing from the conversation -- plus size fashion. In a recent article, our friend, Whitney Bauck, Assistant Editor at Fashionista.com made a solid point that while the average woman wears a size larger than 14, there are only a handful of sustainable brands with the size range to offer plus size women more ethical shopping options. If eco-fashion startups value body inclusivity, why aren't there more sustainable options for plus size women? We asked the question on Instagram where we met and had a lengthy conversation in the comments section with Mary Alice Duff, Founder, and Designer of the Philadelphia-based brand, Alice Alexander. 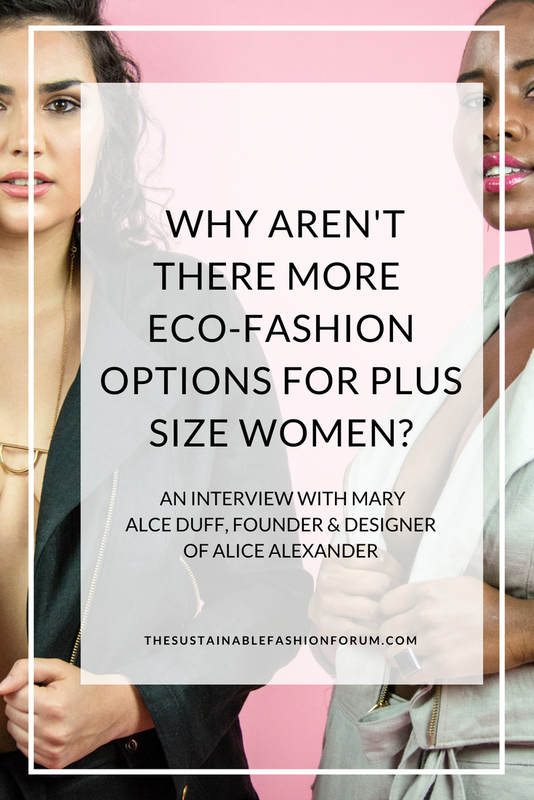 From the true production cost of expanding a size range, the myth that plus size women won't invest in high priced fashion and the lack of education/training on plus size design in schools, we chatted with Mary Alice Duff offline about why eco plus size fashion is still being overlooked. MARY ALICE DUFF: I'm Mary Alice Duff, founder, and designer at Alice Alexander. I live in Philadelphia (born and raised!) with my husband and daughter and our rescue dog and cat. I love all things Philly. I'm definitely an idealist and typically can be found on my soapbox musing about all things body positive and feminism. I attended Marist College in Poughkeepsie NY on a Division 1 basketball scholarship and studied Psychology with a minor in Sociology. I’ve always been deeply committed to human rights issues and immediately after undergraduate I enrolled in a dual master’s degree program at Bryn Mawr College, earning a master’s in social work and a master’s in law and social policy. I worked in the nonprofit sector for 10 years advocating on behalf of those affected by poverty. I’d always loved clothes and fashion but never thought I’d be able to marry my passion for justice and my love of fashion—considering what we know about the fashion industry, these areas of interest felt at odds. I was inspired to become a designer when after having a baby my body changed and I went from a size 12/14 to a size 16/18 which is what I like to call the 'fashion cliff'. With that size difference, you go from being able to fit into the majority of chain stores to fitting almost exclusively in plus size stores. Suddenly my stand-by wool and silk staples were unavailable to me in my new body. In a moment of complete and utter frustration, I had a wild idea, “what if I sewed my own clothes?”. I had always known how to sew and was taught by my grandmother but didn’t know anyone in real life who sewed clothing. With just a few minutes searching on the internet I found an entire world of women, including lots and lots of plus size women designing and sewing their very own wardrobes. Learning to sew my own clothes and getting very familiar with my body was pivotal in my journey towards body positivity AND fashion design. When I say ‘learning to sew my own clothes changed my life' it is not an exaggeration. As I got better and better at sewing and started getting loads of compliments on my new clothes I had an epiphany. What if I could find a way to marry my love of fashion with my love of all things social justice, feminism and body positivity? That's when the idea for Alice Alexander was born. While working my full-time nonprofit job, I enrolled in a fashion design program, learned everything I could about the industry, came up with a business plan, saved up some money and launched the biz. A year later and I'm confident that starting this business and leaving my old career behind was the best decision I ever made. What inspired you to make sustainability a part of your ethos? I actually never really considered myself an environmentalist or someone deeply committed to sustainability. In fact, I was a bit of a fast fashion junkie in my twenties. As I got older and started treating my clothes as an investment I began to realize that the clothing that I felt best in, and felt best against my skin were fabrics like linen and wool and eco-friendly fibers like Tencel. When I started sewing and investing my personal time into creating my wardrobe I realized that if I was going to spend 10 hours designing and stitching a garment for myself to wear it better be made out of the best fabric I can find, which in addition to feeling amazing, is also far easier on the planet than polyester. As I started learning about fabrics and fibers I was shocked at how terrible fabric production is on the planet, especially considering we’re making and buying clothes to only wear a handful of times before tossing them. For me, adopting sustainable practices is just good business! Natural fibers last longer, pill less and generally wear better than polyester. Natural fibers like cotton, linen, and wool are incredibly easy to work with, which means quick cutting and sewing. We’re also super-mindful about our waste because when you’re working with fabric that’s $11 a yard you have to be smart. Often times we’ll recycle scraps into new things to get every penny out of a yard of fabric. It’s funny I did not set out to build a “sustainable” brand. I set out to make beautiful, quality clothing inclusive of all women. But it turns out quality and sustainability go hand in hand. When we make better quality clothes, out of better quality fabrics they last longer, are worn longer and tossed out less. It’s a win, win, win. Alice Alexander started as a plus size brand that later expanded to include sizes 0-28, why was it important to you to include such a wide range of body types in your line? I wrote an extensive blog post about the transition here: https://alicealexander.co/blogs/news/why-we-made-the-jump-from-plus-size-to-size-inclusive. But quickly, I’ll say it really hit me when I was vending at an event during the holiday season and a woman was looking at my clothing. She loved everything I was offering, my stance on sustainability and ethical production but then she noticed that all the pieces were in larger sizes. This woman wore about a size 8, she was very petite and yet full busted and still she had all the same complaints that I hear time and time again. Ill fitting clothing, terrible materials, boring designs, poor labor practices. It struck me that the fashion industry came up with this very arbitrary cut off of what is and what is not plus size, and then to make it easier from a design and production perspective we’ve divided shoppers according to their size. Instead of building a brand around a specific aesthetic, ethos and price point and then inviting all women to shop with us. I realized that by excluding smaller women I was still being exclusive and feeding into this structure that the fashion industry has built that is serving no one but the industry itself. Expanding the size range has been a massive investment but I feel confident it was the right decision for us. Why do you think more sustainable designers don’t include a larger range of sizes? First, I’ll say that it’s not just sustainable designers who don’t include a larger range of sizes. It’s all designers. Although the plus size market is growing it’s still incredibly small especially when you consider that the majority of American women (67%) wear larger sizes. I've read and heard lots of conflicting theories as to why sustainable designers don’t often include a larger range of sizes. Excuses range from a belief that plus-size women won't spend more money on clothes or that plus size women won’t invest in higher quality pieces. Considering the buying power of the plus size market I can’t see how one wouldn't’ recoup their investment if their fit is on point and their marketing is on target. It’s not impossible to design and create clothing in larger sizes, it's just not a priority for a lot of brands and therefore they don't invest the time, energy and resources. All that being said, I think in reality there are deeply held stereotypes about plus size bodies: that plus size women are less healthy, less concerned about the environment, more indulgent, etc. etc. which doesn't align with the brand image of some of these sustainable/ ethical companies. I often hear designers say the development cost to produce clothing larger than a size 12 is really expensive. What are the real differences in designing for a larger body type? I’ll start by saying that the development costs to start a fashion brand are notoriously expensive regardless of the sizes you’re offering. Startup costs are high, profit margins are slim and the field is crowded. That being said, designing for a larger body type is pretty much the same as designing for a smaller body type. I start with a concept, a silhouette, I source fabric, I start to play around with the idea. I sketch in the style lines. etc. Then I’ll move to draping the garment, seeing how the fabric lays then stitch up a muslin, or a sample garment in inexpensive cotton fabric. After this the initial sample goes off to the professional pattern maker who has decades of experience on the technical side perfecting fit for a diversity of bodies. Now here is where our process starts to differ from typical fashion brands. Since our size range is twice the size of normal size range our pattern comes to us in two different sample sizes, a size 8 and a size 20. The general rule of thumb is that you can’t grade, or size, a pattern more than 6 sizes in any one direction before it starts to throw off the fit. So for example, if your sample size is a size 6 you really shouldn’t grade that pattern up to a size 24. In fact, to get the best fit you should create a new pattern in a larger size then grade from there. So instead of having one pattern for each style, we actually have two patterns for each style. One pattern that is graded sizes 0-10 and one pattern that is graded sizes 12-28. After receiving our sample patterns we then sew these in muslin fabric and test them on fit models. Because we generally do a lot of separates, and because most women are not the same size on top and on bottom we have several different women try on the sample garments. We tweak the fit according to the fit model sessions then send that feedback to the pattern maker. If there are significant changes that need to be made we will do another sample run. If no significant changes are necessary we’ll go right into grading with the size 8 sample now becoming 0-10 and the size 20 sample becoming sizes 12-28. I think the real differences in designing for plus size women are purely technical and not stylistic. Today’s plus size woman wants to wear the same styles as smaller women. We don’t want to hide in shapeless sacks and boring colors. We don’t want a “plus size version” of the design. We just want it in our size. I know some designers will create a design and then alter the style lines for a plus size woman to create a piece that is more “flattering” . I personally don’t subscribe to that world view. I design for all women, regardless of body type, I focus on technical fit and then I allow the woman to pick the pieces she wants to rock. For example our most popular item, our tie back crop top, comes in 14 different sizes. I focus on the design, the aesthetic and the technical fit then I let the consumer decide how she wants to present herself to the world. Whether she’s a size 28 or a size 0 that is the same crop top design. Designers aren’t necessarily being taught in fashion school how to design for larger body types. Why do you think that is? Did you go to design school? Did they teach plus design in your classes? I did not go to formal design school. I started my career in the nonprofit sector. At 30 years old I started seriously sewing for myself because I was so fed up with the crappy clothes in stores. The more and more I sewed and the more knowledgeable I became I realized that there were some serious gaps in the apparel market particularly around high quality, size-inclusive design. I enrolled in MADE Institute’s designer development program, a local Philadelphia based non-degree design program, to get formal design and sewing training (all my previous training had been learned from my mother/ grandmother and the internet!). The pattern making and draping classes I took did not discuss plus size design. The books made no mention of designing for larger bodies. When I was enrolled in a draping course I had to pad out vintage form to get a shape that somewhat resembled today’s size 14. I read an article just the other day that FIT had it’s very first plus size model on their student runway and my reaction was, are you kidding? It’s FIRST in 2018?! How is this possible? In my discussions with other designers, industry veterans and reading through text books and school curricula I’ve found that for the most part traditional design schools are incredibly reluctant to teach plus size design. Now whether this is because they don’t understand it or they think that plus size fashion is a passing trend (spolier alert, it’s not) I’m not sure. But I do know it’s just not being taught. Have you run into any obstacles while expanding your line? If so, How have you overcome them?Of course, there are always obstacles. When you decide to buck the system and do things in a way that is counter to everything the industry has said is the way to do it there will be blocks. For one, there's the start up expense. The startup costs of offering 14 different sizes is more expensive than offering a range of 6 sizes. Communicating our message has also been a challenge. As consumers were so ingrained in this plus size/ straight size paradigm it’s hard to wrap our heads around a brand offering all sizes. Being insistent upon fair wages (we start at $15 per hour), vertical integration (we don’t outsource and we don’t wholesale) and sustainability have all been challenges but we’re so committed to doing things this way that there just isn’t an alternative. Set your goals, work towards them, ask for help, take a break when you need to. Really nothing is insurmountable or out of reach if you’re willing to put in the work. Many designers say that they are barely making a profit due to the quality of materials, craftsmanship and paying fair wages to their employees which makes it difficult for them to want to add on the potential financial challenges of expanding their line. You invested thousands into patterns, fit tests etc. but for the designer that wants to offer a larger size range but doesn’t have thousands to spend, how can they expand their range? You’ll need funding to expand your size range to pay a competent pattern-maker and test out the new sizes, there’s really no getting around that! The question is, is it a priority for the designer and is there a strong business case to be made for expanding the size range. (For me, this was obvious, yes and yes!) This is an investment in your business, as the business owner, you need to decide if it’s a good investment. To fund our expansion we launched an Indiegogo campaign and our community really rallied behind our message of inclusivity. We were able to raise $11,000 in 23 days, $2,000 of which went directly to research and development into our new size range. I’d highly recommend crowd-funding as a means to getting the funding you need for the development costs. Alternatively, to those just starting out I suggest starting your size range in the middle with sizes 6-18 then expanding from there as you can. And lastly I'll say if you're barely making a profit, increase your prices! You aren't running a charity (and I would know, I helped run one of those for 5 years). Although the plus size market is estimated to be extremely profitable, sales within the plus-size market aren’t necessarily there. Why do you think that is? For the brands that are getting it right, the sales ARE there. Universal Standard is a great example. They started just a few years ago and have been growing at a rapid pace and recently expanded their line to include sizes 6-32. They’re getting tons of investor funding and growing by the minute. Their marketing is sleek, the brand imagery is beautiful, their collection is cohesive and the fit and quality is widely heralded. The fact is there may be more and more brands offering extended sizes but there are not a lot of GREAT plus size options. Most are lackluster and larger sized women are forced to settle for subpar. And frankly, I’m not going to buy subpar clothes. I want a brand to WOW me. And then you’ll get my money. Collectively the industry needs to step up it’s game. And the retailers that get this are the ones who are going to get the sales. What's one thing you wish more people knew about plus sustainable fashion or, being a plus designer? Plus size women aren’t some special breed of people. We want the same things that smaller sized women want. Beautiful clothing, quality materials, exceptional fit, ethical and sustainable business practices. Designing clothes that fit the majority of American women (67% of us) is good business sense. Ignoring us is only going to hurt your business. I’ll also say that inclusion, in every aspect of the word, is the future of fashion. Thin white women are not the only people who care about sustainable and ethical fashion and yet these are the faces who are chosen to represent ethical and sustainable brands. We need to include all women, all sizes, all ages, all races in the design, research, production and marketing of sustainable fashion brands. It’s just that simple.